Universal Kids (originally PBS Kids Sprout and later simply Sprout) is an American pay television channel owned by the NBCUniversal Cable Entertainment Group, a division of NBCUniversal, all owned by Comcast. The channel was launched on September 26, 2005. The network was first launched as a joint venture between PBS, Comcast, Sesame Workshop, and HiT Entertainment devoted to children's television programming aimed at a preschool audience. Following Comcast's purchase of NBCUniversal, the company gradually bought out the remaining owners' shares in the channel, reaching full ownership in 2013. The network's operations were subsequently relocated from Philadelphia to New York City and the "PBS Kids" name was dropped from its branding. The network rebranded under its current name on September 9, 2017 to take the branding of sister company Universal Pictures, expanding its primetime programming to focus on a wider youth audience aimed at older children, while continuing to broadcast preschool-oriented programming under the "Universal Kids Preschool" branding during daytime hours. Universal Kids is available to approximately 56 million American pay television households (48.2% of households with television) in the United States as of January 2016 (when it was still primarily known as Sprout). Universal Kids traces its origins to the PBS Kids network (referred to as PBS Kids Channel in press materials), which launched on September 6, 1999 coinciding with PBS Kids' rebrand that day. The PBS Kids feed was available on high-tier subscription providers, and was also offered to PBS member stations for use on a "cablecast" service (a subscription-based local channel provided by the member station) or for use on the member station's free-to-air analog channel to provide a portion of the daytime PBS Kids programming on the station. Participating stations were required to pay an annual fee of $1,000 to use the feed. At launch, 32 PBS member stations had signed up to use the service. The channel was created, in part, to compete against Nick Jr. and its sister network Noggin (which now shares its name with the Nick Jr. block). Because the pay-TV rights to the Children's Television Workshop's program library were owned by Noggin (which CTW owned a 50% interest in at the time), the channel did not broadcast any CTW programming, including Sesame Street, a long staple of PBS' children's programming lineup. The CTW-produced Dragon Tales, which premiered on the same day as the launch of the PBS Kids Channel, was the only exception to this. The channel was not successful and had only reached 9 million households as of 2002, compared to Noggin's 23.3 million households at the time. Once the channel shut down, many member stations which had been using the PBS Kids channel on their cablecast channels or free-to-air digital subchannels continued to operate their children's channels as local services scheduled independently of a satellite feed, while other member stations shut down their kids channels entirely and redirected viewers of those channels to the newly launched PBS Kids Sprout. PBS later revived the PBS Kids Channel on January 16, 2017, this time with an online streaming option in addition to utilizing largely the same distribution methods that had been used for the original channel. Former logo used as PBS Kids Sprout from September 26, 2005 to November 13, 2013. On October 20, 2004, PBS announced that it had entered into a joint partnership with cable provider Comcast, and production companies HIT Entertainment and Sesame Workshop to launch a then-unnamed subscription-based channel aimed at preschool children. On April 4, 2005, Comcast announced that the network would be known as PBS Kids Sprout, launching initially as a branded video on-demand service before launching strategy for the Playhouse Disney brand, explained that with this practice, "you get to sample a huge variety of material. You'll get all these smaller shows that translate into something bigger." The network would be advertising-supported, but ads would only air between programs in small quantities, and would be aimed towards parents and caregivers. The linear network officially launched on September 26, 2005, with a reach of around 16 million viewers across Comcast and Insight cable providers. Zoom was the last program shown on the PBS Kids Channel while Boohbah was the first show to air under the PBS Kids Sprout name. The multi-platform approach was designed to appeal to different viewing habits, with the linear channel focused on variety, and the on-demand services focused on instantaneous access to specific programs. The linear service was designed around dayparted programming blocks, featuring activities and other feature segments presented by on-air hosts. Some of these segments were designed to promote supplemental content (including activities and interactive features) on Sprout's website. Sprout's scheduling also eschewed the practice of combining multiple episodes of short-form children's series into a single half-hour episode with interstitial segments for U.S. broadcast, electing to air such programs individually in their original format. Andrew Beecham, a former director of worldwide programming strategy for the Playhouse Disney brand, explained that with this practice, "you get to sample a huge variety of material. You'll get all these smaller shows that translate into something bigger." The network would be advertising-supported, but ads would only air between programs in small quantities, and would be aimed towards parents and caregivers. Final Sprout logo used from November 13, 2013 to September 9, 2017. Comcast acquired a 51% majority stake of NBCUniversal in January 2011, and would assume full ownership of the company in 2013. As a result, Comcast's interest in Sprout was turned over to the company. When Apax Partners sold HIT Entertainment to Mattel on October 24, 2011, HIT's ownership interest in Sprout was not included in the deal and was retained by Apax Partners. In 2012, Sesame Workshop sold its interest in Sprout to NBCUniversal, which in turn later acquired Apax and PBS's shares in the network on March 19, 2013 and November 13, 2013 respectively, thus giving Comcast full ownership. Its operations were then merged into its NBCUniversal Cable Entertainment Group subsidiary, the "PBS Kids" branding was dropped from the network's name (leaving it as simply Sprout), and operations were moved from Philadelphia to New York City . On July 7, 2012, Sprout began to produce a Saturday morning block for NBC aimed at preschoolers, NBC Kids, along with MiTelemundo, a Spanish-dubbed version of the block airing on sister network Telemundo that airs on both Saturdays and Sundays, which replaced Qubo (a previous joint venture between NBCUniversal, Ion Media, Corus Entertainment, Scholastic, and Classic Media, which was later acquired by DreamWorks Animation and is now, in turn, owned by NBCUniversal), which had been airing on NBC and Telemundo since September 2006. With NBC Kids being replaced with Litton Entertainment's The More You Know E/I block on NBC by September 25, 2016, MiTelemundo retained on television with the same programming from the former NBC Kids block. Since NBCUniversal took over management of the network as shown above, Sprout evolved from its initial intent (including Caillou, which remains on the schedule today) to serve as a home for archived content produced by the partners, and invested more heavily in original programming in order to better compete with fellow preschool-oriented pay-TV networks Disney Junior and Nick Jr., which in turn was also partly made by SW. Under NBCUniversal, programs seen on the network such as The Chica Show gained increased visibility airing on NBC as part of the NBC Kids block. In January 2017, Deirdre Brennan, formerly of Corus Entertainment, was named the new president of Sprout. Former Universal Kids logo, used from September 9, 2017 to April 12, 2019. On May 1, 2017, it was announced that Sprout would be rebranded as Universal Kids on September 9, 2017. With the rebranding, the network revamped its evening and primetime programming to target pre-teens aged 8-12. Universal Kids continues to broadcast preschool programming, initially retaining the Sprout brand, occupying 15 hours per-day of programming from 3:00 a.m. to 6:00 p.m. ET. Network president Deirdre Brennan explained that Universal Kids' new programming would be distinguished from its competitors, stating that "we're offering something to 2 to 12 year olds that has a slightly different purpose — widening their eyes, opening their minds and celebrating many aspects of being a kid. We have great [shows] for the preschoolers, which is important, but we needed to grow up with the rest of the family." Universal Kids will initially focus on acquired programs and unscripted series (such as Top Chef Junior, a spin-off of the Bravo reality franchise Top Chef), with plans for scripted original programming in the future. NBCUniversal intended to make "significant" investments in original content for Universal Kids over the next three years. The launch lineup featured a large number of international acquisitions, particularly from Australia and Canada; Brennan acknowledged that since youth audiences had become "globally aware", the network wanted to showcase foreign series that had not yet aired in the U.S.
Universal Pictures' acquisition of DreamWorks Animation in 2016 would also be leveraged by Universal Kids to bolster its programming; industry observers felt that the DWA purchase and the launch of Universal Kids were meant to help NBCUniversal establish a viable multi-platform presence in children's media, and give the company a competitor to other major children's brands such as Cartoon Network, Disney Channel, and Nickelodeon. Universal Kids has also aligned itself with DHX Media and its Canadian Family, Family Chrgd and Family Jr. television channels by acquiring and co-producing a number of series together. DHX had previously signed a partnership with DreamWorks. After the relaunch, the channel has seen a significant erosion in viewership, with IndieWire reporting a 30% decline in 2017, followed by a 73% drop in 2018. Brennan was replaced by Frances Berwick as network president in February 2019. 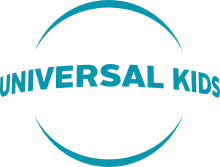 On April 12, 2019, Universal Kids revealed a new logo. Original programs produced for the network include the Top Chef youth-oriented spin-off Top Chef Junior, a U.S. edition of the Japanese game show The Noise, a revival of Beat the Clock, and American Ninja Warrior Junior. In addition, following the buyout of DreamWorks, the channel currently several DreamWorks Animation programs that were originally Netflix-exclusive: All Hail King Julien, DreamWorks Dragons: Riders of Berk, The Mr. Peabody and Sherman Show, Noddy, Toyland Detective and The Adventures of Puss in Boots. The rest of the network's programming is mainly programming from the international children's market. Universal Kids Preschool acts as the channel's current daytime block, which runs from 6:00 a.m. to 6:00 p.m. Eastern Time (3:00 a.m. to 5:00 p.m. on weekends). Up until January 2018, the block utilized the network's former name, Sprout. Deirdre Brennan emphasized that Universal Kids would continue to focus on its preschool programming, explaining that "the greatest thing is, there is nothing to fix there. Sprout is a beautiful brand. If anything, we want to invest more in original production. There is more we can explore there." Prior to the Universal Kids rebranding, the network replaced its long-running morning block Sunny Side Up with Sprout House (renamed Snug's House in 2018), which debuted on August 14, 2017 and is hosted by Carly Ciarrocchi and the new character Snug, a talking dog portrayed by puppeteer Chris Palmieri, through 90-second segments throughout the block. The program was designed to be more flexible to produce than its predecessor, with a varied "tiny house" set with additional areas and camera options. Unlike Sunny Side Up, its segments are pre-recorded rather than broadcast live; supervising producer Vinny Steves felt that the live format was too "limiting", and stated that the new format was also designed to enable the segments to be distributed on digital platforms such as social media. With the launch of Sprout House, the network began to downplay its long-time mascot, Chica, although she will continue to be featured in certain segments (such as Chica at School). ^ "Cable Network Coverage Area Household Universe Estimates: January 2016". Broadcasting & Cable. January 31, 2016. Retrieved January 24, 2017. ^ "Multi-purpose PBS Kids takes flight next week". Current.org. Retrieved November 19, 2015. ^ "PBS launches kids network". Variety. Retrieved November 19, 2015. ^ "Sesame quits Noggin network". Current.org. Retrieved November 19, 2015. ^ Evans, Greg (February 23, 2016). "PBS To Launch PBS Kids – A 24/7 Children's Channel And Live Stream". Deadline Hollywood. Retrieved September 10, 2017. ^ "Comcast, HIT Entertainment, PBS and Sesame Workshop Announce Plans to Launch Ground-breaking 24-hour Preschool Children's Television Channel" (Press release). Arlington, VA: PBS. 2004-10-20. Retrieved 2013-08-03. ^ a b c d "Saluting Sprout's Launch: PBS Sprouts a Kids Triumph". TVWeek. Retrieved 2017-09-12. ^ Braude, Jonathan (October 24, 2011). "Apax sells Hit Entertainment to Mattel". The Deal. Retrieved August 3, 2013. ^ Jensen, Elizabeth. "NBCUniversal Takes Full Ownership of Sprout Cable Network". New York Times. Retrieved 10 February 2014. ^ "Governor Cuomo Announces that NBCUniversal's Sprout the First 24-Hour Preschool Network Will Relocate to New York City". Retrieved October 26, 2014. ^ "Sprouting her wings". Philadelphia Inquirer. June 8, 2014. Retrieved June 9, 2014. ^ Nordyke, Kimberly (November 13, 2013). "NBCUniversal Acquires Ownership of Kids' Channel Sprout". The Hollywood Reporter. Retrieved April 13, 2014. ^ Hagey, Keach (November 13, 2013). "NBCUniversal Buys Remainder of Sprout Network". Wall Street Journal. Retrieved November 14, 2013. ^ Luis Clemens (February 16, 2008). "Qubo's Rodriguez: Offering a 'Building Block' to Kids". Multichannel News. Reed Business Information. Retrieved September 23, 2014. ^ James, Meg (28 April 2016). "Comcast's NBCUniversal buys DreamWorks Animation in $3.8-billion deal". Los Angeles Times. Retrieved 28 April 2016. ^ "NBC Will Launch NBC Kids, a New Saturday Morning Preschool Block Programmed by Sprout®, Saturday, July 7". MarketWatch. March 28, 2012. Retrieved July 15, 2013. ^ Rubino, Lindsay (March 28, 2012). "NBC, With Assist From Sprout, to Launch Saturday Morning Preschool Block". MultiChannel News. Retrieved July 15, 2013. ^ Jensen, Elizabeth. "NBC Universal Takes Full Ownership of Sprout Cable Network". The New York Times. Retrieved 10 February 2014. ^ a b Getzler, Wendy (May 1, 2017). "A new age: Sprout to become Universal Kids". Kidscreen. Retrieved May 1, 2017. ^ a b c d Steinberg, Brian (2017-08-10). "NBCUniversal Builds 'Sprout House,' Hopes Kids Will Visit". Variety. Retrieved 2017-08-17. ^ a b c d "Universal Kids Acquires Bear Grylls Series Ahead of Relaunch (Exclusive)". The Hollywood Reporter. Retrieved 2017-09-11. ^ a b Steinberg, Brian (May 1, 2017). "NBCU's Sprout Grows Up: Universal Kids to Debut in September". Variety. Retrieved May 8, 2017. ^ Barnes, Brooke (April 30, 2017). "NBCUniversal is Building Its Own Children's Channel". The New York Times. Retrieved May 1, 2017. ^ "NBCU EVP Duccio Donati Takes on DreamWorks Channel". Animation Magazine. August 3, 2017. Retrieved August 4, 2017. ^ "Duccio Donati tapped for new kids role at NBCUniversal". Kidscreen. August 4, 2017. ^ Milligan, Mercedes (September 6, 2017). "DreamWorks Toons, 'Deep' & 'Masha' Animate Universal Kids Debut". Animation Magazine. Retrieved March 11, 2019. ^ Pinto, Jordan (August 29, 2017). "The Next Step heads to U.S. TV". Playback. Brunico Communications. Retrieved March 11, 2019. ^ Evans, Greg (April 10, 2018). "Universal Kids Sets First Original Comedy 'Greenfields' For Fall". Deadline Hollywood. Penske Media Corporation. Retrieved March 11, 2019. ^ Pinto, Jordan (April 9, 2018). "Hulu commissions Holly Hobbie kids series". Kidscreen. Brunico Communications. Retrieved March 11, 2019. ^ "DHX Television's New Programming Lineup Puts the 'All' into Fall" (Press release). Toronto. August 28, 2018. Retrieved March 11, 2019. ^ Wolfe, Jennifer (December 8, 2015). "DreamWorks Animation Signs Content Deal with DHX Media". Animation World Network. Retrieved March 11, 2019. ^ Schneider, Michael (December 28, 2017). "Most-Watched Television Networks: Ranking 2017's Winners and Losers". IndieWire. Penske Media Corporation. Retrieved March 11, 2019. ^ Schneider, Michael (December 27, 2018). "Most-Watched Television Networks: Ranking 2018's Winners and Losers". IndieWire. Penske Media Corporation. Retrieved March 11, 2019. ^ Dickson, Jeremy (February 15, 2019). "Brennan leaves Universal Kids in reorg". Kidscreen. Brunico Communications. Retrieved March 11, 2019. ^ "FremantleMedia N.A. Sells Two Game Shows to Universal Kids". Broadcasting & Cable. Retrieved 2017-10-17. ^ "Universal Kids adds two FremantleMedia game shows". Kidscreen. Retrieved 2017-10-17.